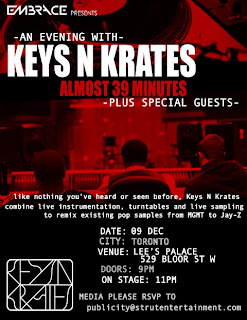 Let's continue with the interview with Matisse (keys) from Keys N Krates! Bryen: You guys are doing pretty well as a great example for a band in a digital age, where there are samplings and copyright issues. Have you guys had any problems at all so far? Matisse: Ah, not really because of the way we are performing. You know, I’m not sure how it works, but legally wise, it's ok to perform songs just like any other bands play cover songs. Or something like a DJ plays different tracks right? Matisse: We give our music away at shows and people download them for free. So for our songs, we don't really... we have the way to exploit it. I know Girls Talk kinda got a bit of flack for blowing the doors wide open on the copyright issue. Matisse: I am sure that we will cross that road when we come to it. And when we do, we will be ready for it. Bryen: That's good. You've mentioned before that you didn't have anyone to look to in terms of contemporaries. But Greg Gillis and Girl Talk are definitely something getting really big, but it’s definitely different from what you guys do. Would you consider him to be one of your contemporaries? Matisse: Depending on how you look at. If you are looking at some of his using samples, then yes, definitely we have the same data sample wise. Even across it more of a band. you know, how it produces. We look at ourselves more like you know Def Punk or say Metric or we look at ourselves more like a band. Bryen: Yeah his stuff is quite more like a robotic. Matisse: As a band we use samples, that is a first piece of sounds. but it is a part of the sample culture. you know you can say that that is Girls Talk alike, but again, he is more a DJ producer and we are more like a band kinda of thing.So there is instrument involves in our band. A lot of times our sample sound our own sound, and it makes us special. Matisse: We are moving into own orignal compositions base soon as well. Bryen: That's really cool. now that it's because you can actually have a physical record out? That is what the goal is? Matisse: Yeah, I think we would like to get something out. Because we feel like that we've been doing music for people. We wanna get more into that as we can do more of actual productions and songs that have a longer song life. and you know it's just it's natual perfection as an artist that we wanna kinda have more original stuff. Definately we wanna include samples themselves, but you know they need to get a couple of artists to feature on stuff and a couple of things that bores songs. Well, we think that remixing is a big step to just add on. Bryen: Is there anyone in patecular that you would like to work with? Matisse: Oh men, that's such a tough quesiton! Bryen: Hahaha. ok then, let's say that you only have a one shot and it's your dream artist. who would that be? Matisse: One shot,,, dream artist... wow. Bryen: It's a tough one. Bryen: The name is escaping me right now, too. I have the album somewhere in my rack. Bryen: What's for the other guys ( DJ Jr. Flo and Drummer Adam Tune)? Like what their personality brings to the group when you guys are touring, I guess it's a small van that you guys are touring in? Is it a bus? What are you guys working with so far? Matisse:We usually use a van. it's smelly sweaty van that is full of gears. You know, music. we play lots of music or a complete silent, which is nothing. depending on how we feel. someitmes we shut up all. or we have all sorts of conversation or sometimes we read audiobooks here and there. Matisse: But we get to play usually with a small small van. Well we gradually higher up I'm sure that it's gonna be a tour bus or all kinda stuff, but you know. Bryen: Do you guys have any insane story from the road so far? Matisse: Yeah, but you know, right now I'm trying not to share that with the public. Matisse :We had a time when we were on the road and on the stage and sometimes you know, we got people coming onto the stage and they were acutally jumping so much that it was skipping the record that we played, so we had a show that the drum kits were falling apart. No one knew what was going on so we just partied around and three of us were looking at each other panicking. Bryen: Just doing your best right? Matisse: Yeah. you know, it's just the part of the road that just happens. Bryen: What can you tell us in terms of your latest remix, Almost 39 minutes. Yeah it is almost 39 minutes long. Matisse: It's dedicated to the live on the floor but we got a lot of new tools. One tune that used a lot of drums. Adam (Tune) was able to triger a lot of drums the way it tricks. Bryen: That's cool, that's wicked. Matisse: It was a specific snears so it's still very organic simple drum kits. Matisse:Yeah, myself as well, I added and was able to set up my keyboards in the way that I could trigger sounds and dubbs samples and effects. I pretty much did sampling on my keyboads and put it on a specific note. We all set them up as one insturment sounds like three instruments. So we only have three guys in the band, but we sounds like we have 6 guys, sometimes 9 guys. We were able to break it down and layer out so many different parts and it's really been a contribution for us. Bryen: It's like a degital orchestra. Bryan: Anything that we can expect from the December 9th show at the Lee's palace? Matisse: It's the first show that we play after releasing the song ( Almost 39 minutes.) We just figured out how to play it in a live. So probably you can look forward to that. Bryen: I'm sure that people go crazy for that. Matisse: Yeah, it's one of our first songs that we put it together as an official remix. As well as new auditing music software that we have and we just have and we just gota couple of new sounds that we are excited to play. One is a sample from a track from Kanye (West) way back in days. Matisse: Which we flipped it and it sounds crazy, so we are excited to play that. Bryen: I am looking forward to listening to that. Matisse: You know,it's a thursday night so everyone having a good time and we are excited to be home in Toronto. Bryen: Sounds awesome! and how long are you here after that? Matisse: Well, we are gonna be rehasaling and being in a studio in the rest of the year. and we will be starting touring again once january the new year comes. Bryen: Awesome. Men, so see you at the show on the Dec 9th and thank you so much! 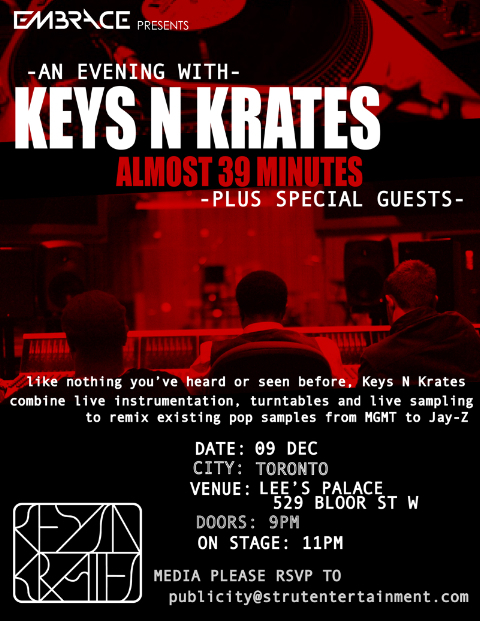 “Keys N Krates plays Lee’s Palace on Thursday December 9th”. Don't forget tp chekc out the link below to get to know more about the Trio, too!